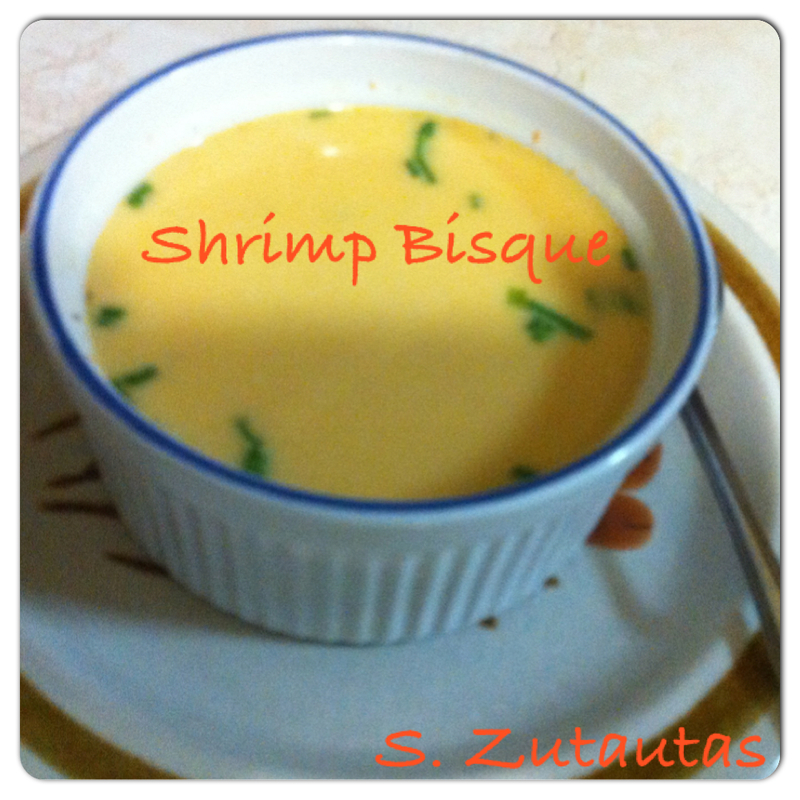 If you're looking for a special entrée to go with a seafood meal and don't mind a little extra effort in the kitchen, please follow along and I'll show you how you can make a delicious shrimp bisque in your kitchen. I must say that even though this bisque or soup does take a little bit of extra time to prepare than your average soup, it is well worth it in the end. It is not something I'd make all the time but for special anniversary dinners, Valentine's Day dinners, when you want to impress someone special, or are perhaps having the boss and his wife over for dinner this bisque will knock their socks off. The perfect entrée for an intimate dinner party for four or more people. When I make this recipe I do it in several stages starting out with peeling the raw shrimp. I then chop all the veggies and prepare the bisque. Once everything has been pureed and chilled I heat the bisque adding the whipping cream and lemon juice before serving. Remove the shell and tails off each defrosted shrimp setting aside the shells. Cover and refrigerate the shrimp while preparing the bisque. Ready in: 1 hour 30 min. Finely chop the celery, carrot and onion. In a Dutch oven or stock pot heat and melt 3 of the 4 tablespoons of butter. Add the chopped veggies along with the thyme and cook until the veggies are soft. Next add the shrimp shells and tails cooking for a few minutes until the shells are pink. To the pot add the clam juice, water, and stir bringing everything to a boil. Turn the heat down to a simmer and let cook for 25-30 minutes covered. Over a large bowl using a strainer, strain the broth into the bowl. Add the broth back into the pot and whisk in the cayenne pepper and tomato paste. 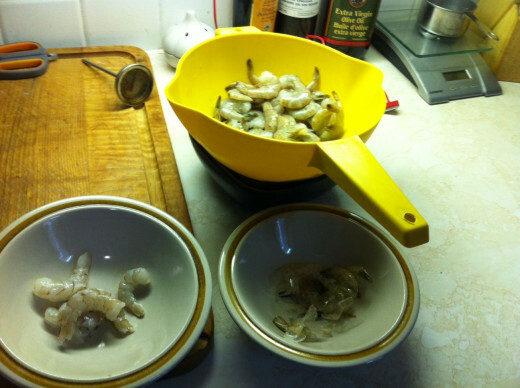 In a small frying pan melt the remaining tablespoon of butter and quickly cook the shrimp until they are pink. Add half of the liquid broth along with 1/2 of the cooked shrimp to a blender. Puree and place into a clean bowl. Do the same with the remaining broth and shrimp. At this point you can cool off the bisque and refrigerate until you are just about ready to serve. The final and next step doesn't take very long. In a pot heat the bisque, stir in the lemon juice and whipping cream until heated through. Serve and top with the chopped chives. Serve with salt and pepper to taste. ENJOY!